The low-energy version of classic Bluetooth will be one of the foremost enabling technologies for the IoT. Bluetooth low-energy (BLE) is one of the emerging disruptive technologies for the IoT. Also referred to as Bluetooth low-power and Bluetooth smart, as the Bluetooth SIG is calling it, this technology will enable the next level of IoT vertical devices, such as medical devices, home automation, retail, wearables, and much more. For consumers, it comes down to the Internet of Your Things (IoYT – yet another iteration in the craze to find a personalized moniker for your corner of the IoT world). You wake up and go for a run with a heart rate monitor that speaks directly to your smart watch. You brush your teeth with a sensor toothbrush while listening to music through your showerhead. Your computer senses you just sat down in front of it and it turns itself on. You watch your kids play basketball with a “smart” ball that analyzes their play style. You unlock your doors, turn on the lights, and run your TV with your smart phone or your wearable BLE device (which interfaces with your smart phone). And that is only a partial laundry list of devices that can integrate a Bluetooth module. The nice (and smart) thing about BLE is that it inherits all the functionality, standards, and interoperability that its parent, BT classic has. That means developing for the BLE platform has a lot of technology that can be ported. It is just designed to use less energy. BLE is designed to be exactly the opposite of its bigger, faster brothers, 1.2, 2.0 + EDR (the enhanced data rate version), and 3.0 +HS (the high speed version). BLE is designed for small data-transfer payloads with low duty cycles. “Where classic Bluetooth devices can run on a couple of AA batteries for a couple of months, the smart version can run on a coin cell for a couple of years,” says Kroeter. There is some question as to where BLE will find a niche among so many competing technologies, including Wi-Fi and ZigBee, but there certainly seem to be some applications, such as the body area network (BAN) where the network is constrained to a very small perimeter bubble around the body (sports, medical, gaming, implants, wearables). It also can work for other platforms such as computers (keyboards, mice) and is a promising platform for many types of sensors in the IoT, especially those that might not be viable if frequency battery change-outs are required. Peeling back the layers and looking at the technology finds that the design re-uses much of the existing framework for BT radios, including the 2.4 GHz ISM band. That means it is backward-compatible with all existing BT designs. Following is a laundry list of specifications, and we will dissect some of them a bit further on. A table of more precise specifications is given at the end of this article. OTA data rate: 1 Mbps. Modulation scheme: GFSK (see note 2) with frequency hopping. Max output power: +10 dBm. Nominal output power: 0 dBm. Major operational modes: advertising, scanning, master device and slave device. Packet data transfers: 8 to 27 octets per packet. Latency: As low as 3 ms, 6 ms is typical. Robustness: 24-bit CRC per packet. Built-in security: AES-128, with counter mode, CBC-MAC, and application layer user defined. Topology: 32-bit scatternet, one-to-one and one-to-many. BLE improves on classic BT in a number of areas that relate to power footprints. BLE boasts energy efficiencies of 20 times that of Classical BT, yet reduces power consumption by an order of magnitude in some places. It does this by using a number of schemes and a very simple link layer that is capable of a fast connect cycle. Typically, a BLE device spend only 1% of its time awake, (lowest sleep mode can will typically consume < 1.0 A) and when it does wake, the idle current mode is a few tens of A. When in data transmission mode, that peak current rises to 15 mA, maximum. There are three main elements that are used to accomplish this. They are an intelligent host controller, and an adjustable duty cycle and message length. As far as the controller goes, being smart means it has the ability to monitor activity and respond only to activity that requires action specific to the host. That mean the host can remain in sleep mode much of the time. The other two primary low-energy components are the adjustable duty cycle and message length. The duty cycle can be adjusted down to as low as 0.1%. What that does is present app and device developers a minimal target to aim for to give them maximum run time, should that be their goal. The adjustable message variable gives the app the options of packaging messages in longer or shorter packages for efficiency. The reasoning is that longer single messages are more energy efficient than multiple short messages, mainly due to setup and tear down overhead, but other system parameters have an effect, as well. Another key parameter for efficiency is robustness. Frequency hopping is used because it is relatively immune to interference, thereby reducing redundancy requirements. This is particularly useful in multi-wireless environments, such as the home, or public wireless hotspots where multiple protocols exits (Wi-Fi, ZigBee, cellular, etc.). The more cycles that wireless device has, the more latency becomes a factor. Simply put, latency is created when the activity needs to add extra processing to the signal. This can be due to link budgets, signal or component instability, or signal strength. BLE addresses that by its simple architecture, which uses small packets and simple protocols. BLE is designed for small-packet transmissions. Typically that includes between 8 and 27 octets (see note 3) per data package. Additionally, connections implement sniff sub-rating (see note 4), which provides very low duty cycles. Perhaps the greatest doctrine of BLE is its simplicity. 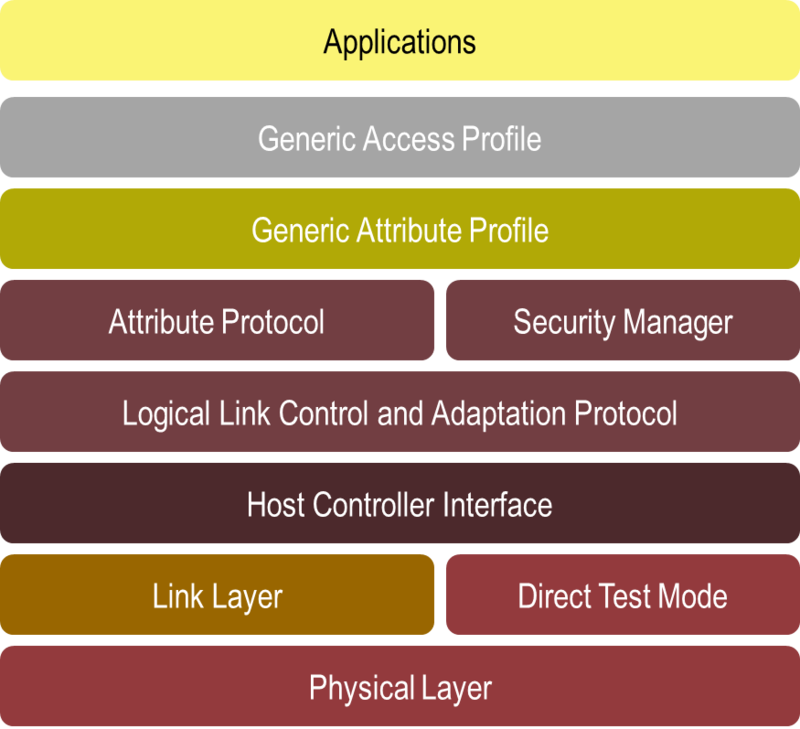 The layered GATT architecture (see Figure 2), simplifies creating and implementing profiles. Because ease of implementation was part of the initial design considerations, applications and embedded devices can be quickly fitted to the BLE architecture. In addition to all the tricks used to reduce power, the most significant design feature is the channel configuration. The BLE mantra, simplicity, and economy is a result of fewer channels. This propagates throughout the design in producing the low-energy footprint. For example, BLE uses only three channels as advertising channels, where classic uses 32. This reduces time on air, which in turn reduces the power envelope. The three-channel design requires only 0.6 to 1.2 ms to scan for other devices, in contrast to the 22.5 ms and 32 channel scan that the classic version uses. The protocols that BLE uses also contribute to BLE’s energy efficiency. Classic uses nine different protocols, BLE only one – the attribute protocol (ATT). This is a sequential configuration that allows only one request at a time. It is based on a client/server architecture that is a much simplified read/write protocol requiring significantly less power to run. Finally, BT and BLE are a bit more secure, intrinsically, principally because the interconnect processes are between two paired devices. That requires an authentication process which, once initiated, provides relatively secure communications between the devices. Included in this security envelop are mechanisms for authentication, encryption, authorization, even man-in-the-middle protection. BLE uses the industry-standard Diffie–Hellman, FIPS-compliant, encryption for key generation. And, once the keys are generated, and the data is encrypted with the 128-bit AES cipher. For all BLE seems to be a fit for, one must remember that BLE devices are a general classification of short messaging scenarios. BLE cannot be used for transmitting streaming content or long complex conversations. Generally, the baseline for BLE applications is that is needs to spend most of its time in the off state. For applications that meet that criterion, BLE is an ideal platform. Bluetooth 4.2 is a just-released (December 2014) update to the core 4.0 specification; 4.2 expands upon 4.0 by adding support for low power IP (IPv6 and 6LoWpan). This adds some new flexibility and enables IoT connectivity. It also adds a bit more intelligence in the form of security. With this update, a Bluetooth smart location tracker can only be followed by the owner or trusted group. And finally, the data bandwidth has been increased. Throughput has been increased by a factor or up to 2.5X and packet capacity has been given a 10-fold uptick, so the total data payload is now 270 octets. BLE promises to offer a low-cost, low-profile, ultra-low-power and ultra-efficient short messaging platform. The ubiquity of the market is still developing but there is promise in a number of areas such as sports, medical, PANs and sensors. As the IoT unfolds, there will be a significant amount of opportunity for communication between objects that fits this short-range, low duty cycle, low data packet envelope. Some areas, such as in-home automation, and in-vehicle communications, are rich in exactly the type of communication BLE is designed for. And, last but not least is the IoT. Low power will have a high value in the IoT. With so many possibilities, and so many devices, low energy will be a primary consideration. So the future for BLE cannot be anything but bright. Note 1 Theoretically, distances up to 200 ft. are possible, but for that to work, the ultra-low e Gaussian Frequency Shift keying modes do not make use of PN codes. In this case, all devices on the same frequency can communicate with one another, and co-location capabilities are potentially reduced. Note 2 GFSK mode is the fastest data rate. However, care must be taken in its use. Because this mode eliminates the advantage that DSSS technology has, making it much more susceptible to errors. Note 3 An octet is an 8-bit word. In most cases, it is the same as a byte. It is also commonly used to represent any of the four bytes of an IPv4 address. Note 4 Sniff sub-rating is a Bluetooth feature that enables paired devices to negotiate, based on usage, the frequency of sending “keep alive” messages to one another.